The end of the internal troubles, which had erupted when Stefan the ‘first-crowned’ died, and the beginning of a relative stabilisation with the accession of Uroš I (1242-76), coincided with the start of the intensive exploitation of the mineral wealth of Serbia, the driving force of the country’s progress. German miners from Hungary, probably from the territory of the self-styled Saxons of Zip (who were generally known as Sasi in Serbia, Bosnia and Bulgaria) had stimulated the productivity of the mines, and by the end of the thirteenth century, they had developed them very considerably. The mines were behind both the commercial expansion and the stable currency which enabled the Serbian kings to implement their policies. Byzantium soon became aware of the effects of Serbia’s economic development when Stefan Uroš II Milutin (1282-1321) began to realise his plans for expansion, with the active assistance of the Serb nobles, who were behind his annexation policy. The Serbs seized northern Macedonia with the towns Skopje (Skopia in Greek), Štip (Stypeion), Veles (Belesos) Debar-Debra (Dibre), and it was only after painful negotiations that the Emperor’s representative Theodorus Metochites managed to satisfy the demands of the Serbian nobles who had benefited most from the confiscation of Byzantine lands. Milutin was to marry Andronicus II’s daughter Simonis, aged 5, who would bring him the regions he had already conquered as her dowry ( 1299). 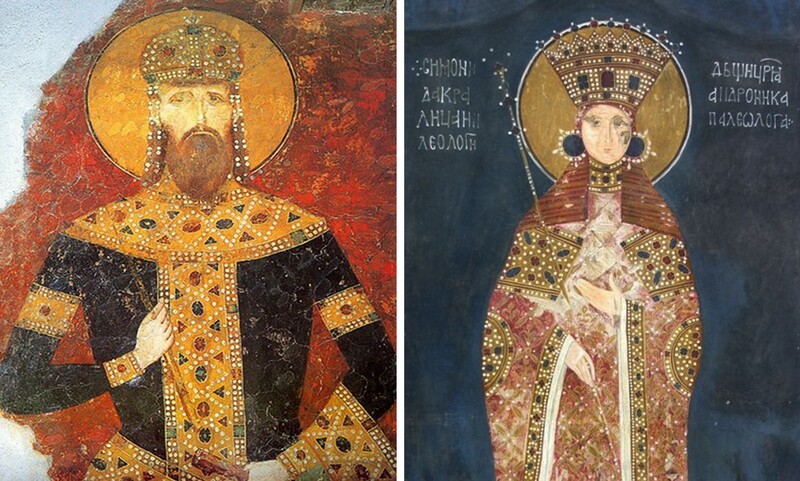 Serbia herself, as was only fair, began to feel the strong impact of Byzantine culture, which was adopted in court circles and grew more intense as more Byzantine territories were incorporated into the Serbian State. Even the Byzantine pronoia system was adopted by the Nemanjides, probably even before Milutin’s reign, whence the first references to it in Serbian documents. The Serbs had only legalised the system already existing in their conquered lands, by which the properties of local pronoiars were administered, and which subsequently spread into Serbian lands as well and to Zeta, where it was still to be found under Venetian rule. Serbia took an active part in the Byzantine civil wars from their first phase, trying to extract maximum profit from them while consolidating their alliance against the Bulgarians. The victory they achieved over Tsar Michael Šišman at Velbâžd (nowadays Kjustendil in Bulgaria) in 1330 put an end to the Bulgarian—Byzantine alliance and contributed to strengthening Serbian hegemony in the Balkans. The victor of Velbâžd himself, Stefan Uroš III Dečanski (1321-31), shortly afterwards fell victim to the avidity of the Serb nobles who, seeking to extend their territorial gains, had the king assassinated and replaced by his son Stefan Dušan (1331-55) who owed his political existence to them. The nobles effectively imposed their grand schemes for Serbian expansion on the new king, whose advance into eastern Macedonia, seizing Prilep (Prilapos), Strumitsa (Strimvitza, Stromnitza), Vodena (Edessa), Ohrid (Achrida) and Kastoria, was temporarily halted when Dušan and Andronicus III signed a peace treaty in front of Thessalonica in 1334. Hostilities were quickly resumed with the outbreak of the second Byzantine civil war, which was really won, as we know, by the Serbian king. Dušan was able to complete his conquests in Albania and Macedonia at the expense of a disunited Byzantium without really having to fight a battle, as well as taking several towns such as Kroja, Berat (Belegrada), Avlona, Berrhoia, Serres, Drama, Philippoi, Chrysopolis and even Mount Athos. Thessalonica thus became a Byzantine island isolated in a vast countryside occupied by Dušan, soon to become Lord of Epirus and Thessaly as well as Aetolia and Akarnania (1347-8). The moment had come when his ambition to suppress the Byzantine Empire and to replace it with a new one in which Serbs would hold political power, but which would retain the same form, could be realised. It was a replay of the same struggle over the Imperial title that Charlemagne and the Carolingians, the German Emperors and the Bulgarian rulers had conducted earlier. Dušan referred to himself in his charters as ‘Basileus and Autokrator of Serbia and Romania’ (Greek charters) and as ‘Tsar of the Serbs and Greeks’ (Serb charters), which expressed his particular ideology very adequately. As a natural consequence of these changes, the Archbishop of Serbia Ioannikios was nominated `Patriarch of the Serbs and Greeks’ thus endowing the Serb Empire with its own Patriarchate and responding to its new needs. It assumed its greatest symbolic significance with the solemn coronation of Dušan at Skopje in April 1346 in the presence of the Patriarch of Tarnovo, the self-appointed Archbishop of Ohrid, and even representatives of Mount Athos, whose monasteries were soon rewarded for their voluntary submission. The third move necessary to consolidate his new authority was to establish a legal foundation by promulgating the Code of ‘the Blessed Emperor Stefan’, which also guaranteed Serbian and Greek landed property. The State was officially divided into Serbian territory (Srpska zemlja) made up of the ancient lands where old Slav titles such as župan, knez and voivode were de rigueur, and into ‘Romania’, the conquered Byzantine territory where the institutions and titles of the Byzantine administration were retained (for instance the term cephale to designate the governor), to the extent of setting up Judges General similar to those in the Greek provinces. 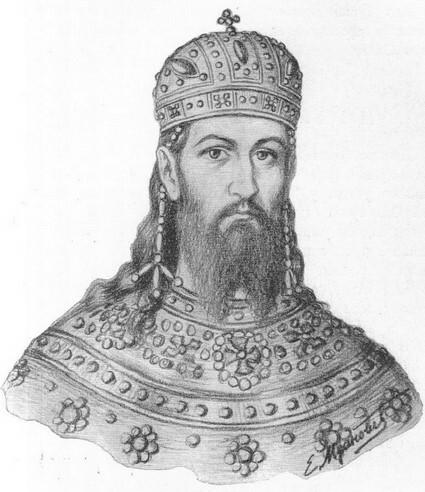 Although the first territory had been officially handed over to Dušan’s son, King Uroš, he was still so young that the arrangement was purely nominal and the real master of the whole Empire was still the Tsar. The legal system, like the administration, was generally copied from Byzantine models, with the basic difference that the main detainers of power were now Serbs, with Greeks being retained only exceptionally in the civil or military service, or indeed in ecclesiastical office. The principal effect of this was to transfer most of the lands of the Byzantine nobility into the possession of the Serb feudal lords, as allods (baština) or as pronoia estates, as in the case of the land granted, probably from the time of Dečanski, to the Protosebastus Hrelja, in the Štip region, part of which at least had belonged to Byzantine pronoiars. Dušan’s foreign policy was directed towards securing an alliance with Venice in view of their common enterprise against Byzantium. This did not interest the Serenissima in the least, since she was concerned above all with fomenting Dušan’s hostile intentions towards Hungary, against whom he was obliged to maintain a defensive stance, having given up Belgrade and Golubac. As for his relations with the Papacy, for all his intransigence towards the Roman Catholic ‘semi-faithful’ whom his Code prohibited from marrying Orthodox Christian, Dušan did make a few approaches to various Popes with the obvious object of harming Constantinople. These came to nothing and anyway the Tsar’s premature death put an end to all his grand plans for hegemony over the Balkans.